This is the second part of the meta review, looking at the commander choices and build orders for the three allied factions as used in WPC series and Tric's Tournament (TT). It is recommended to read the axis part first as it contains some background information on the data and more explanations on what is shown in the figures and tables that follow. We have 75 replays for the Soviet. In addition, commander loadouts and picks are taken from cast for four more games. Out of the total 79 games, 50 were against OH. The most popular SOV commander is Guard Motor Coordination Tactics (GMC), which was only on fourth place during the ESL series earlier this year. 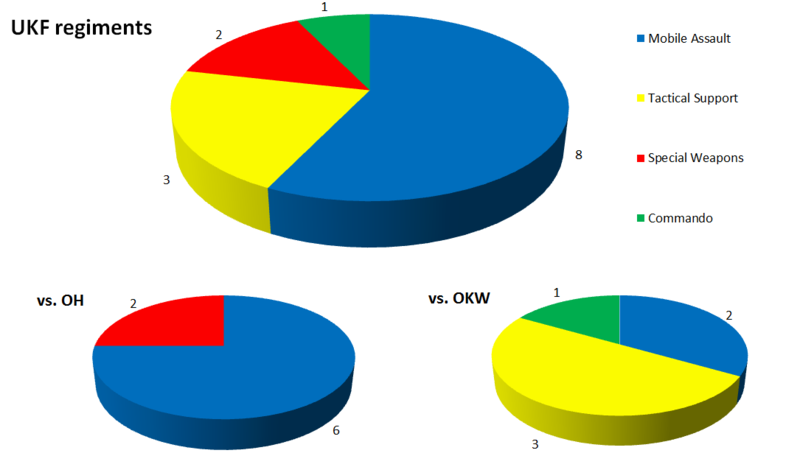 The "other" category in the pie charts above contain Urban Defense and Soviet Reserve Army vs. OH and Counterattack and Soviet Shock Army vs. OKW. GMC is used in about a third of the games, so it is not as dominant as e.g. Mechanized Assault for OH. A lot of other commanders saw a significant amount of usage as well. The top pick from ESL, Armored Assault Tactics, now ended up as also-ran. While GMC was the top pick during WPC and TT, the rest of the ranking differed. 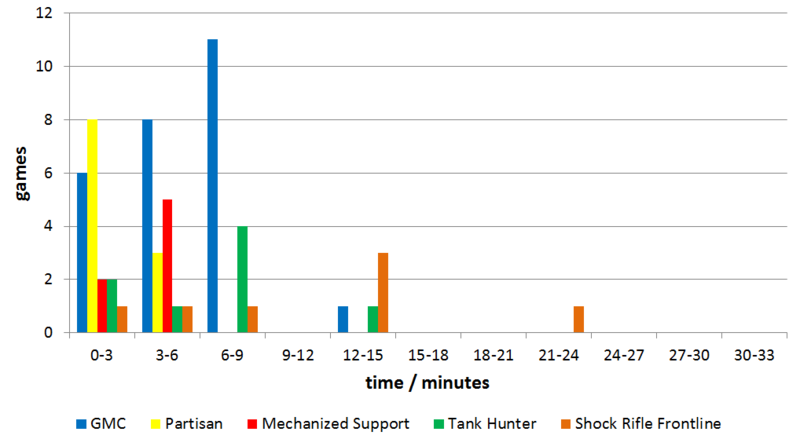 During TT, Partisans were only used once in 22 games, while Tank Hunter Tactics was on second place. The table above shows which players used the top five commanders. The number in brackets indicate how many games the player play picking the commander. 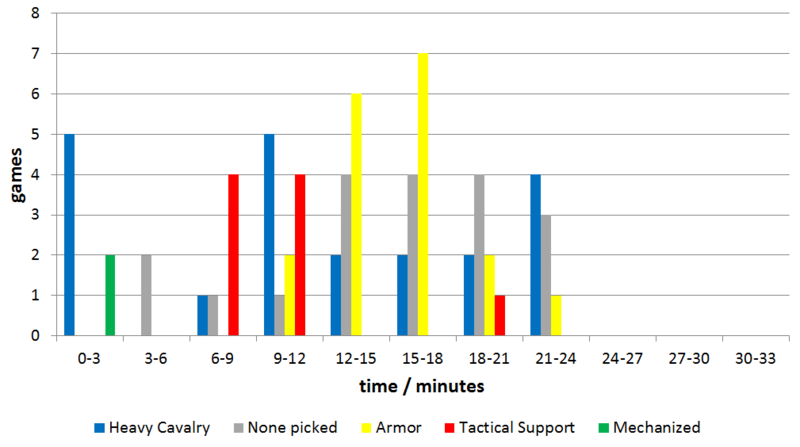 Most SOV commanders were picked rather early in the game, in particular compared to the other factions. This is most pronounced for Partisan Tactics, which provides radio intercept and AI partisans already at zero and one CP. The two doctrines with guards, or Tank Hunters are often locked in slightly later as their light AT abilities are available only after two or three CP. The only doctrine from the top five that is picked later is Shock Rifle, likely for the KV-8 and IS-2 call-ins. The diagram above shows that GMC was part of almost every loadout. However, unlike the axis' loadouts which mostly consisted of the top two commanders and plus one other doctrine, there is no clear "second" commander. This is also obvious in the specific loadouts listed in the spoiler below. While GMC, Partisan and Armored Assault/Tank Hunter Tactics have often been used against OKW, there is no dominant loadout against OH. As stated earlier there are 75 replays from which teching and build orders (BOs) are derived. The table above summarizes the tech choices for the SOV games. Note: The "T? built" means that that tech building was built at any point of the game, while e.g. "T1 start" means that T1 was the first building to be build. The split between T1 and T2 starts is an almost perfect 50:50. The T1 opening unsurprisingly was picked mostly with a doctrine that provides some sort of light AT like guards or AT partisans. However, the GMC commander was used almost as often with a T2 opening. The next commonly used commanders with a T2 start were Shock Rifle Frontline and Armored Assault which do not provide AT solutions. The percentage of "T1 start" and "T1 built" is identical so nobody teched back to T1 after starting with T2. However, T2 was built occasionally after some T1 starts. T3 (and the field infirmary) was built in almost all games, while T4 was built in about half of the games. AT grenades have been researched in 64% of games, while molotovs were used in only 15% of games, mostly with commanders that rely on conscripts as mainline infantry. TM-35 mines were quite popular, but demolition charges were still built a considerable amount of time. It has to be noted though that replays only contain orders to place the charges; it is likely that in several cases the engineers were issued new orders before they started constructing the mines, effectively canceling the build order without explicitely doing so. Thus, the number of actually placed mines or demolition charges will be lower. While conscripts are often considered weak, they still are still built in most games and overall were fielded more than twice as often as Maxims or penals. The latter two have been used about equally as often. On average, three penal squads were built in games that saw the unit at all. Guards were called in in all games that featured suitable commanders. On average, about two guards squads have been built per game. Shock troops are seen not often but still were called in in each game with Shock Rifle Frontline or Soviet Shock Army. The most built SOV vehicle is the T-70. It was the first vehicle out of T3 in 55 games, in six games it was the SU-76M, and once the M5. The games saw slighlty more T-34/76s than T-34/85s. Overall, all stock vehicles saw considerable usage (maybe with the exception of the M5), in contrast to OH where doctrinal vehicles dominated. According to the table, if a T-70, T-34/76, SU-76M or T-34/85 was built at all in game, the game on average saw a second unit of the same type. The table above shows at which point of the match doctrinal vehicles were called in for the first time in a game. The IS-2 is split between Shock Rifle Frontline (SRF) and Armored Assault (AA), because the latter also contains T-34/85 which of course require T4. The Lend & Lease M4C was called in before T3 was built. However, the majority of the other vehicles were called in the first time after T3, and some even after T4. The table below contains all BOs deployed in the replays. The most commonly used BO was four conscripts followed by a field infirmary. That said, given that SOV have three different units that they can use as mainline units (conscripts, penals and Maxims) it is not surprising that BOs are very diverse with 65 different BOs in 75 games (compared with 68 BOs in 101 games for OH or 42 BOs in 61 games for OKW). The most popular commander for USF overall was Heavy Cavalry Company (HCC), although the Armor Company (AC) has been picked at almost the same rate (see diagram below). In fact, AC was picked slightly more often than HCC during TT. A considerable number of USF games ended without any commander being picked. The table above shows which player used which of the five top "commanders" how often. Several players (e.g. DevM, Noggano or Theodosios) used both HCC and AC, indicating that the choice is situational, similar to OHs Mechanized Assault (MA) and Mobile Defense (MD) Doctrine. The most prominent user of Tactical Support Company was Overlord. The diagram above, showing at which point the top five commanders were picked indicates another similarity to OH: The picks of AC - like those of MD - resemble a bell curve. However, while the center of that curve of MD was around the light vehicle phase, the center of AC is around the phase around when medium vehicles appear. Also similar to MA, there are quite a few games in which HCC was picked right off the bat, while in others this happened in the same phase in which the AC picks occurred. The diagram above shows how often commanders appeared in the loadouts, while the table in the spoiler below lists the specific loadouts. Not surprisingly, most of them consist of HCC and AC plus an arbitrary third company. The clear winner as third commander is Tactical Support Company, even though it ended up being used basically by only one of the players bringing it. The table below lists the teching choices for USF. There were slightly more games starting with Captain instead of Lieutenant (55% vs. 41%), but the lead is not huge. Also, it seems worth noting that the most successful players of the WPC series, DevM, Jesulin and Noggano predominantly started with Lieutenant. Teching Captain at least in one point during the match is very common (85%), while backteching to Lt. is less usual. The Major was built in about 47% of games (mostly when AC was not the commander of choice, see below). In terms of side-grades, weapon racks were more popular than grenades, although e.g. DevM ended up researching grenades more often than the racks. Both types of caches were built more often than for any other faction. Likewise, the tournaments apparently saw more fighting positions than OH bunkers. Both indicate that manpowerbleed was less an issue for USF. The table above shows the USF infantry units fielded during the tournaments. Note that "Captain" and "Major" do not refer to the tech, but rather to rebuilds after the original squad obtained by teching was wiped. Of course, Riflemen (RM) formed the backbone of the USF with on average almost four squads per game. There was no replay file in which a Rear Echelon spam was attempted (this is more clear in the build orders below). Unsurprisingly, the mortar was quite popular, being used in about two-thirds of games totally overshadowing the Pack Howie. However, there were not that many games that saw multiple mortars. Rangers were called in in not even half of the games played with HCC. The most built vehicles after the ambulance are the Stuart and the Sherman. The Sherman was built about twice as often as the OH Panzer IV, even though there are 16 replays less available for USF. While the top spots are taken by these stock units, the most commonly used call-in is the M10; each game played with Armor Company saw about three M10s on average, while in at least about half of those a Bulldozer Sherman was used. The table above shows when the first doctrinal vehicle of its type was called in. In most cases, the Pershing was called in after the Major was built, so in most cases it was not used to circumvent teching. The same is true for the Calliope. The situation for the vehicles from AC is different, which were called in mostly after Lt. AND Cpt. were teched. The spoiler below shows the BOs employed in the replays (the red Xs indicate that no unit was built because the games ended early). USF is notorious for not having the most variety in early game BOs and while the introduction of the mortar did help a little bit, the total number of build orders is still lower than for any other faction. The first built was always a RM, there was no apparent attempt at RE spam. 66 of the 64 games started with three RM. The most common BO was 3xRM, mortar into Captain. The Brits were picked only rarely and there are even less replays available. In total we have 13 replays involving UKF, only four of which are from the WPC. Commander choices are augmented by one more datum taken from a cast. The table above shows the players for which any data is available. We can see that half of the games were by Hans, so the review in here is by no means broad. It also does not help that a lot of games ended before 20 minutes. Given the limited amount of data, this section will be shorter than for the other factions. The diagram and the table above show which commanders were used and by whom. The most commonly used Regiment was the Mobile Assault, mostly because it was Hans favorite commander (although it was used by two other players as well). The eight games against OH saw only two commanders, Mobile Assault and Special Weapons. The latter was never used against OKW, where Tactical Support Regiment was used most. That said, the sample size is so low that these differences are probably not overly significant. The three regiments most commonly found in the layouts are Tactical Support, Mobile Assault and Special Weapons because that was the loadout that Hans used in most cases (see table in spoiler below). Data is available for 13 games. The Platoon command post was built in each of those. The table below shows the other teching choices. Green percentages are computed based on the total number of games, blue numbers are percentages of games in which the prerequisite was available. For example, the Company Command Post was unlocked in nine games or 69% of games. “Hammer” was teched in two of those nine games (or 22%). Anvil or the Bofors were never unlocked, while the AEC was almost always teched. The sidegrades were not overly popular. Mines were built quite often. The only emplacement that got built were two mortar pits. Overall more sappers than infantry sections were fielded, although all other stock infantry saw relevant usage. Note that “Field Recovery Operations” dispatches two Royal Engineer Recovery squads. The AEC was the most popular UKF vehicle, similar to the Stuart for USF and the T-70 for SOV. The Cromwell was also used in a considerable amount of games and numbers, unlike e.g. the axis medium. While Hammer tech was unlocked twice, no Comet made it to the field. Somewhat surprisingly only one Land Mattress was used. The spoiler below shows the BOs. It turns out that they are rather diverse with eleven different BOs in 13 games. Compared with the other factions, Soviet seem to allow the players the widest variety in terms of unit and commander choices. While GMC was the clear leader in terms of commander picks, it was still “only” used in 34% of games in which a commander was picked. 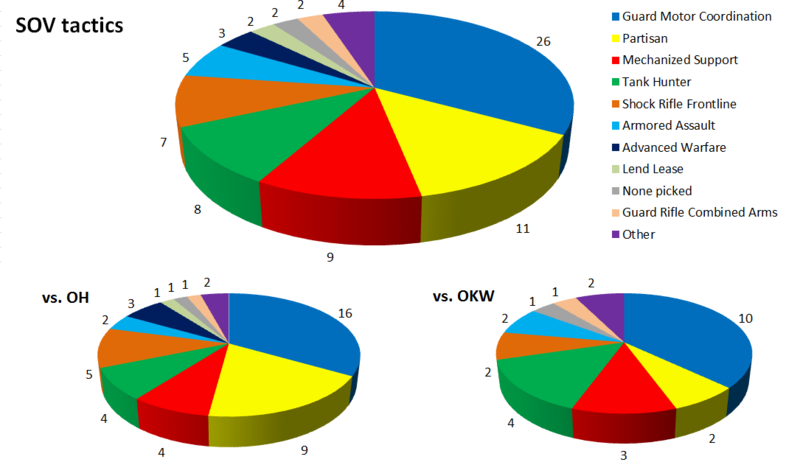 For comparison, the top choices for the other factions were used in 52, 52 and 37% for OH, OKW and USF respectively. 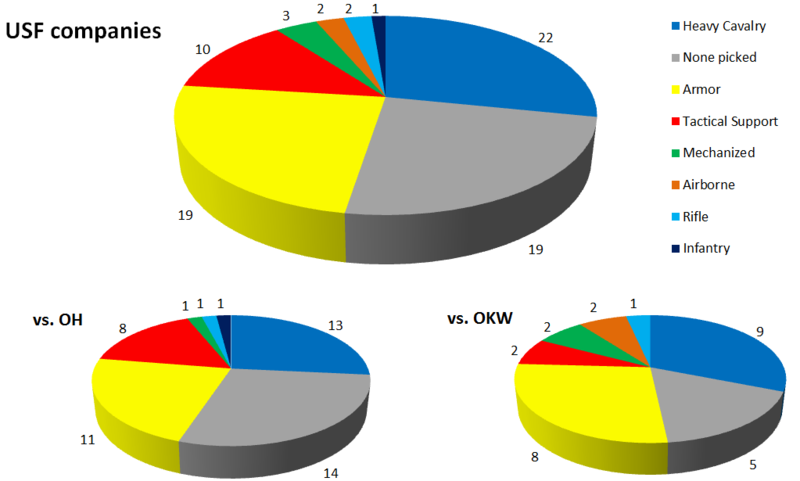 Moreover, the top three commanders account for 60% of games, compared with 85, 77 and 86% for OH, OKW and USF (although comparisons to OKW and USF is somewhat skewed due to the lower total number of commanders for those factions). Further, the tournaments saw 13 different commanders used in 79 games, versus eleven in 101 OH games. Given that three different units can effectively be used as “frontline infantry” (conscripts, penals and Maxims) and that SOV have two starting tiers providing eight types of units in total, it is not surprising that the faction featured a large number of different BOs. T1 and T2 starts were used about equally as often. Almost all stock units saw a respectable amount of usage, maybe with the exception of the M5 half-track. And even though the faction unlike any other is designed around augmenting the unit rooster by doctrinal units, neither call-in infantry nor vehicles dominated. That said, the T-70 appears to be rather pivotal and some of the doctrinal units might appear underused. Still, the review indicates that SOV probably allows the user to employ the most varied playstyles of all factions. USF enjoyed very high winrates during both tournaments (even if we exclude DevM from the statistics). The fact that the commander on average was locked in later than for the other factions and that about a quarter of the games with no pick whatsoever indicates that the faction is not overly reliant on the doctrines. While HCC at times has been chosen early in a game, it was commonly picked rather late, likely in order to call-in a Pershing. Similar to OHs “Oh shoot, a light vehicle!” panic button aka Mobile Defense, Armor Company often seems to be used as response to the appearance of medium axis tanks. Although Tactical Support Company was featured in a lot of loadouts, it ended up at third rank mainly due to being used by one player. Lieutenant and Captain starts occurred in about the same number of games. The Captain was often also teched after a Lieutenant and unlike the Lt. was occasionally was rebought after being lost. Most stock units, both infantry and vehicles, are used commonly. The only call-ins that played a significant role were the M10 and the Pershing and both do not outnumber their non-doctrinal peers (unlike for the axis factions). Relic succeeded in their attempt to make Rear Echelons less desirable as frontline troops. The new mortar was popular. It was most commonly built as the 4th unit. There are not enough replays to discuss UKF meta based on data.